LittleBigPlanet for PlayStation Vita is exactly what you expect it to be. Nothing more, nothing less. Since E3 2011 is the first time press have been able to get their hands on PlayStation's latest portable, it's hard to discuss Vita titles without discussing the system itself. With LBP Vita (no official name yet), this is fitting. The game is designed with all of Vita's touch controls in mind and the game's simplistic, small scale graphics translate wonderfully to the system's bright, wide screen. Maybe a detailed FPS would strain Vita's hardware, but LBP Vita looks like its console counterparts. The demo (made for E3) focused on the puzzle-platforming the series is known for, except now it's paired with new, unique input methods. The first major addition is the ability to interact with objects directly. These marked objects can be dragged across the screen and pulled any which way via touch controls. Sometimes the player moves an object in order to supply a necessary platform to cross a gap. Other times, the player has to spin a wheel, then grab and swing off it. The screen is so wide that I often had difficulty platforming, while dragging an object. The game is still early in development -- it's a 2012 release with no announced date -- but the series' platforming will be made only more problematic if these new additions aren't implemented better. As you may have read elsewhere, the PS Vita has touch controls on both the front and back of the device -- it's like an iPhone sandwhich! LBP Vita cleverly makes use of this by including platforms that you can pop in-and-out with your fingers. Since it's tricky navigating the back of the screen, your finger print shows up within the game to help you navigate on-screen. It's hard to say what kind of gameplay additions this feature will make possible, but I was shown one neat example during the demo. One section of the level presented a Tetris-like series of blocks stacked one upon another. In order to progress, I had to pop each block out without pushing myself off the platform where I currently stood. If a mistake was made, I would push blocks back in and start over. It was a neat puzzle, but all other examples seemed like busy work: here's this platform that you have to push out. Where is the fun in that? Players will not be able to play LBP 1 & 2 levels, but costumes will sync across platforms. Instead, players will create new levels, unique to Vita, with the revised level editor based around drawing geometric shapes with your fingers and popping in-and-out objects via the back and front touch controls -- the developers (two are working on this entry) said the level editor will be the most user-friendly yet. Players can also include items from past games, along with some new additions. However, neither were shown in the demo. Along with 4-player online and offline co-op, the game features 2-player games that can be played on one system. By flipping the Vita vertically, I was able to play a Sackboy-infused game of Air Hockey against an opponent. It wasn't particularly fun or deep, but it presented promise of the games can be made with kids in mind. 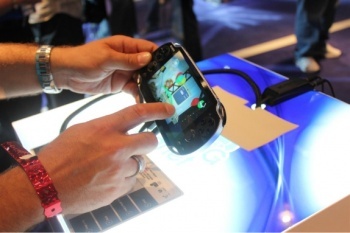 At this stage, it's difficult to say whether LBP Vita will be anything more than a portable rehash with touch controls. But, what's so wrong with that?